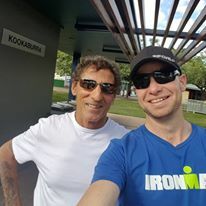 While I was at Ironman Cairns last weekend, I met up with my mentor and one of the best triathlon coaches in the world, Allan Pitman. I got to sit in with a race brief Allan gave his athletes who were racing the Ironman the next day. This would be the fourth time I have listened to Allan give a race brief to his athletes the day before a big race. Every one of his briefs is different but with the same desired outcome……. to get the most out of his athletes. Throughout this race brief, Allan spoke about mental strength, courage, fear, nutrition, transition and laying it all out on the course. One of his favourite sayings is, “Once the training is done, 70% of the race is all above the chin”. When we find that our minds are down and things seem to be in a slump, Allan talked about resetting our minds by counting swim strokes, counting peddle strokes, counting run strides and to keep counting until we are mentally back on track. Sometimes this can take seconds and sometimes much longer. The result of this method of counting along with your body’s movements is that your movements become more accurate and faster. You must be able to control and balance courage and fear. You need to have the courage to push yourself as hard as possible in the swim, push as hard as possible in the bike and push it as hard as possible on the run. Yes, at times you will go into the red. 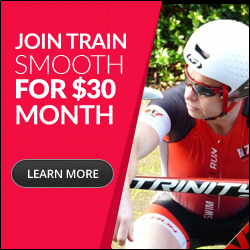 Just like we do in training with intervals, we can often push ourselves on the wind trainer to the point where we cannot do another peddle stroke, yet after a minute of easy spin, we can be back ready to go again. He said it was okay if this occurs when we are riding up a hill in the race. Don’t be concerned about going into the red, because it won’t take long before we are all good and we can keep pushing hard again. Allan spoke about how it is better to under feed than over feed. When you have too much nutrition, your stomach becomes stressed and more times than not, it will come back out through your mouth. It is also harder to add more nutrition when your stomach is under stress. Often you will keep bringing it back up. When you underfeed, you can always add more if and when needed. Salt loading is important. It is good to stay in front of the situation. It is not always cramping that is an indicator that your sodium levels are low. When you wake up for the race, take two salt tablets. Your drink on the bike should include salt, and take salt tablets throughout the race on feel. Transitions are an important part of the race. Races can be won and lost within transition. Allan told us a story of the first time that he qualified for Kona. He won it through transition. The athlete who came second, by under a minute, had a slightly faster swim, bike and run time than Allan, but Allan’s transition times were a quarter of the time of the second placed athlete. Less than one minute separated Allan and this athlete in their finishing time. Allan told another story of his experience one year competing in Ironman. When he crossed the finishing line, he felt great and still fresh. There was plenty left in the tank. He regretted not pushing himself harder throughout the day. From the moment the race starts, you race and you go as hard as possible at that moment.